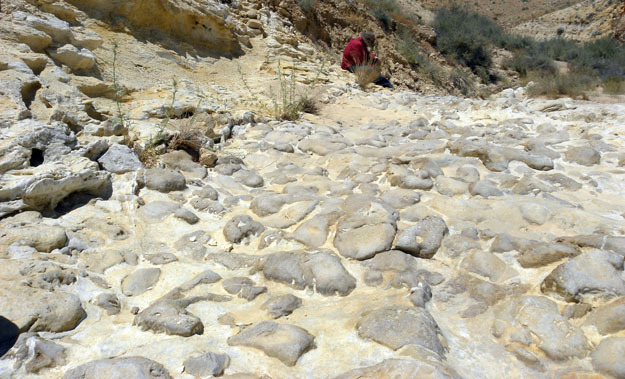 Micah Risacher collecting fossils at one of our northern study sections in Wadi Aqrav. 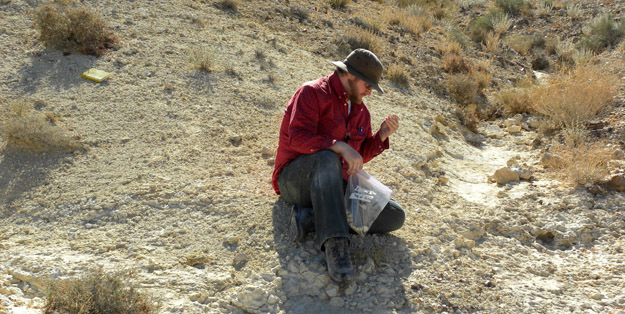 He is gathering fossils from the Zichor Formation (Late Cretaceous). Coordinates: N30° 33.741', E34° 38.926'. 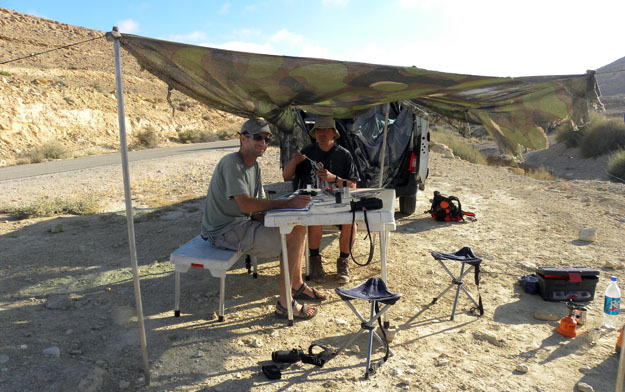 MITZPE RAMON, ISRAEL — Another day of learning Upper Cretaceous stratigraphy from Yoav Avni of the Geological Survey of Israel, this time in the north of our field area. Just as last month in Mississippi and Alabama, we deployed the classic paleontological technique of sitting in one place in the sun and filling little bags with tiny treasures. 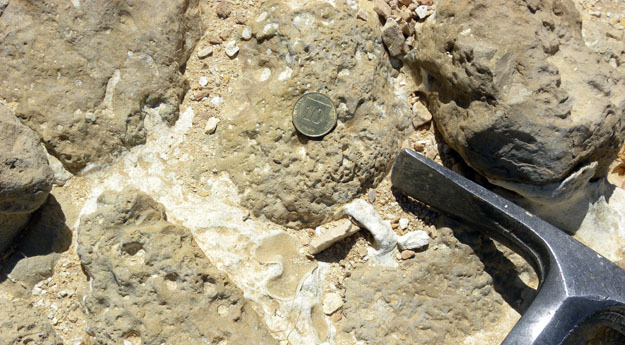 One of our primary goals for this project is to sort out the depositional environments for the Upper Cretaceous units formed near the developing monocline which will become Makhtesh Ramon. We want to test the competing ideas that the sediments of the Menuha Formation were deposited in either very shallow or very deep water. Today Yoav found a bedding plane of cobbles in place at the base of the Menuha. They look like they were on the bottom of a tidal pool after the water was drained. The cobbles are heavily bored by bivalves and worms, almost entirely on their tops. I taught Yoav the American term “slam-dunk” when it comes to supporting the shallow water hypothesis. Bed of cobbles at the base of the Menuha Formation. Micah in the background. A closer view of the cobbles showing that they were bored by shallow water organisms which produced the trace fossils Gastrochaenolites and Trypanites. Don't worry, family members. These items are rare in our field area and easily avoided. I've seen more unexploded ordnance in the Mojave Desert of California. It is a mortar shell, by the way, probably set on the rocky shelf by an absent-minded Israeli soldier decades ago. 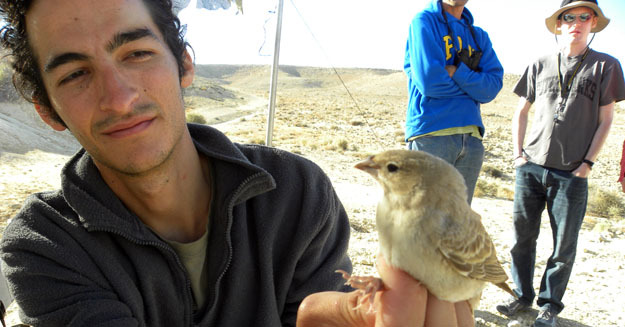 Half of the bird-banding team at Hemet Cistern, north of Mitzpe Ramon. It is always fun to participate in the universal culture of science. Scientists around the world love to talk about their work and ideas with curious strangers, especially if they are also scientists.